Kristine Fitzpatrick, Executive Director and Founder of the League of YES. 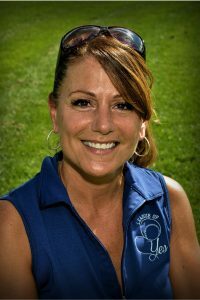 Kristine founded the League in 2010, formally known as the Miracle League of Long Island in association with the Miracle League Organization. In 2014 Kristine made the bold decision to leave the Miracle League and create her own organization named, “The League of YES”, YES- where You Experience Success”. Her mission is to establish and sustain baseball programs for people (of all ages) with disabilities and to make a positive difference in the lives of disabled children through recreation, and to provide physically active outlets. Kristine’s goal is spread the word and joy of this program nationally. Kristine has had a strong background in sports throughout high school and college. Starting at SUNY Delhi, Kristine excelled in Track and Field and in 2008 inducted in Delhi’s inaugural Athletic Hall of Fame as the first woman inductee. Kristine finished her athletic career at St. John’s University and graduated in 1990. In her career at St John’s, Kristine won individual BIG EAST Championship titles in the high jump and javelin. In her final year with St. John’s, she broke the school record in javelin with a throw of 163’. Kristine is known as a pioneer of the women’s track & field program and one of the most accomplished field athletes in school history. Today, Kristine remains in the top-5 all-time in both the indoor and outdoor high jump, with a height of 6’ 2”. Kristine was recognized as a Women of Distinction for St. John’ University 2013. Kristine is still involved closely with St John’s and sits on the Tobin School of Business Board. Currently, Kristine is a sales representative for JCC, a minority, women owned janitorial supply company. Kristine is a proud Mother of two sons Peter and Wade and resides in Dix Hills, NY.